To see cycle skills training available to every New Zealander who wishes to ride safely and with confidence on our roads. Bike Ready is NZTA's brand for cycle skills training. The programme follows New Zealand's cycle skills guidelines, which are based on the UK's Bikeability cycling skills courses. Learning how to cycle properly makes cycling more enjoyable and safer for everyone – children, adults and other road users. CAN’s network of professional cycling trainers aims to promote best practice cycle training, based on the New Zealand cycle skills guidelines. What is cycle skills training? Whatever your age, ability or background, cycle skills training offers something for everyone – whether you cannot ride a bike at all, are returning to cycling after a break or are a regular cyclist who wants to develop their skills further..
An evaluation of the Christchurch City Council’s Cycle Safe Programme showed that trained students were significantly more likely to ride their cycles to school after completing training. Cyclists trained by Cycle Training UK were surveyed on how the training had affected their cycle use. 81% said that they now cycled more often and more confidently. CAN has produced a guide for instructors. It includes lesson plans, road layout diagrams, and how to set up a training course. BikeReady cycle skills training is delivered by local training providers. Here you can find contact details for your region or specialty service. These training providers currently deliver cycle skills training. In a project led by New Zealand Transport Agency, national guidelines are being introduced. CAN is on the advisory group. Cyclist skills training guide (PDF, 4.8 MB, March 2012) - a guide for the set-up and delivery of cyclist training in New Zealand. Cyclist skills training newsletter - a series of newsletters to update you on progress on the development of cyclist skills training in New Zealand. Cyclists skills training - How it fits together - attached as pdf below. CAN members Marilyn Northcotte and Patrick Morgan are experienced, qualified cycle skills trainers. They have been teaching cycling skills to adults and children for more than 10 years. Marilyn says she's keen to get more people cycling more often. Her background includes teaching Kiwi Cycling courses, managing Go By Bike Day events, consulting on cycle training, and running high performance cycling programmes. In 2011 Marilyn has been working with 7 Councils, the Police, and workplaces. She is available for NZQA assessments of cycling instructors, mentoring, and developing programmes. CAN project manager Patrick is on a mission to share the fun and convenience of cycling. In 2007 he completed instructor training from Cycle Training UK. He has co-authored mountain bike guidebooks, written a guide for cycle-friendly employers, and led cycle tours. Patrick led the development of CAN's Bikeability cycle training programme. He has run courses for local government and cycling groups in Waiheke, Palmerston North, Kapiti, Lower Hutt, Wellington and Nelson, training everyone from complete beginners to upskilling cycle trainers. • steer the bike to where they want to go. The trainee cyclist can demonstrate full control of their bicycle while carrying out all-round observation, signalling and manoeuvring. They will not yet have been observed using these skills on the road and in traffic. • equipment needed: at least 20 cones, whiteboard, clipboard, flash cards (where available), basic toolkit and bike pump, first aid kit. The trainee cyclist can safely perform manoeuvres and turns in a variety of traffic environments. They will be able to choose options to deal with minor hazards and demonstrate this in practice. They will show good understanding of traffic awareness and road positioning in these traffic environments. • travelling straight through controlled and uncontrolled intersections. The trainee cyclist understands and can demonstrate a full range of skills to cycle safely and confidently in all traffic environments. • 2 (minimum) - 8 hours, depending on requirements. • rural cycling in high-speed traffic environments. Feedback received: "I want to say thank you for saving my life twice on Monday!!!! i used your drive wide technique - saved my self from being doored on ponsonby road (and gave a lady a big fright!) and from getting killed by a bus ( driving wide of a bus meant moving from the middle of the left lane to the middle of the right lane!) as I was going down college road (end of ponsonby) very steep - so 50km or so. Thanks Patrick!" Last year I worked with a teacher from the school who was putting together a road cycling "Club" within their school. They started off with about 12 kids and quickly moved up to 16. They worked out a deal with Burkes Cycles and have been getting help from that shop. I took them on a number of skills sessions inside the school grounds and lent some of the cycling training books I got from my CAN Instructor course. I then took them out on the road with the teachers and parents and showed them the things to do to keep their bunch safe on the road. Within no time they were competing at the Wellington Schools Road Cycling Champs and followed through to the National Schools Champs in Feilding. By the end of the season quite a few of the kids had medals from National events. This year the school "Cycling Club" is now up to 22 kids. There is high demand to be on the school team now. The School Club meets every Monday and Wednesday morning before school and go for a ride around the bays. The bunch is split into two groups because it's so big when you have the parents riding too. The school is alive with the buzz of cycling talk with the kids. They are heading off to Cambridge this weekend to compete in the North Island Schools Champs with 5 teams of 4 riders. Their plan is to have 30 kids in the School Team next year. The offshoot of all this is that it's got the whole school into cycling. The teachers are amazed at the number of kids who are now cycling to and from school each day. These are not the racing club kids, but the everyday cyclist on every day bikes. The school is now thinking of implementing a rule that if kids ride to and from school, they should all have to wear fluro tops. This year I have been working with Samual Marsden School. Recently they purchased about 8 bikes from Penny Farthings and worked out a school deal with that shop. I have been taking them on bunch rides on Sunday mornings, with their teacher, who is getting the School Team together. They are planning to go away to some National events this year too. We are in the process of working out a series of training skills courses up in Karori for the parents and teachers who want to be a part of the school team, or are just riding on the road. I'm hoping that next year we will see a similar interest where all the girls at Samual Marsden see it as a cool thing to ride to and from school. If you know of any School Teacher who'd like to get a School Cycling Team going, then let me know. I am selling the idea to School bodies that it's a team sport like rowing, not individual. They like this idea as teamwork and team building skills are what schools are about. A group of cycling trainers were under instruction themselves at the weekend, to help teach other cyclists how to kick their bad habits. Ten volunteer cyclist trainers from around the region, including teachers and instructors from the active transport programme Way to Go, undertook a two-day Bikeability instructor training course at Central School, run by Cycling Advocates Network (CAN) with assistance from the Nelson City Council. 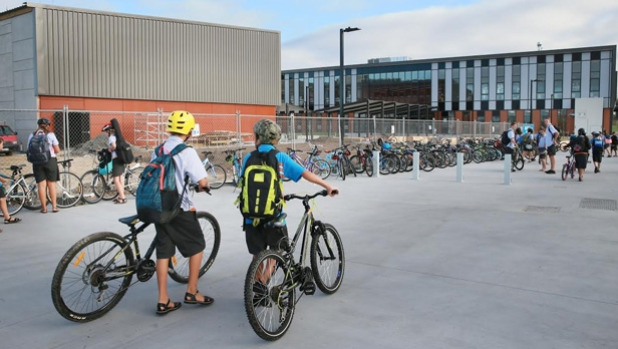 This was the first time the course, which covered skills for grade two and three of the New Zealand cycle skills guidelines, had been run in Nelson. Instructor Patrick Morgan said the focus was on teaching skills to give children and adults a safer and more pleasant cycling experience, and to get rid of their bad habits. These included not indicating, cycling on the footpath, not being visible at night, doing things that confused drivers, riding in a big bunch, and riding too close to parked cars, he said. Lane positioning was also important. "Cyclists shouldn't ride too far to the left as this can make it hard for drivers to see them. "And sometimes drivers need to wait a few seconds - it's not always safe for people to ride too close to the left." Wearing high-visibility gear was also a key strategy. There had been considerable interest in this raised by a coroner in Palmerston North last week at an inquest meeting investigating the eight cycling deaths that occurred nationwide in the past year, he said. The main thing was riding predictably. "And there's a lot of complicated things in Nelson, like multi-laned roundabouts, so you have to navigate these safely." Both motorists and cyclists needed to show respect, he said. "We learn to share when we are in kindergarten, so we need to follow through with that." About 1.5 million people cycle in New Zealand, and Nelson was one of the best cities in New Zealand for riding, he said. The councils had been active in making cycling happen, and education and training was also really important, he said. Volunteer Garry Dunn, a self-employed driving and road safety instructor who spent 22 years in the traffic branch of the police, said this was the first cycling-specific safety course he had done - and cycling safety was something definitely needed. "The other day I was driving down Salisbury Rd, and there was a keen racing cyclist riding on the white line instead of the cycle lane. He sat right on my bumper to draft my ute. Absolutely dangerous behaviour. And I've seen cyclists do that behind logging trucks. "While cyclists are very vulnerable, they have to remember they are, and ride responsibly." Silly Cyclists is a video series which displays behaviour from around the world. They can do many things to be a silly cyclist, be it riding at night without lights to passing a left turning lorry on the inside. The main idea is to teach cyclists how to avoid making common mistakes on the road. These mistakes could put them at serious danger or just make them look silly. http://www.bikenz.org.nz/Article.aspx?ID=6238Online registration for these courses will be available from July 30. 4. Wellington, 15-16 February, 2012. 5. Dunedin, to be confirmed, 2012. Grade 1 assessments: start the week commencing 19 September. 1. Auckland, 30 November, 2011. 2. Hastings, 18 April, 2012. 3. Christchurch, 23 May, 2012. Grade 2 assessment dates will be confirmed by November 1st. 1. Auckland, 1 December, 2011. 2. Hastings, 19 April, 2012. 3. Christchurch, 24 May, 2012. The aim of the national guidelines is that there is a level of quality being delivered across NZ. If you are going to be paid to (or volunteer) take on the responsibility of doing the above three things then do your homework and make sure no one can say you didn't do your best. I am pleased to say that the CTSB ratified the reviewed National Standards at its meeting yesterday. I attended this meeting on behalf of The Association of Bikeability Schemes. The general feeling was that that the reviewed NS is improved and not too radically changed as to create excessive work for schemes. The updated standard does lack a context document which covers points such as overall aim of the NS being to get more people riding and the fact that training is outcome based etc. The DfT agreed to call for suggestions to such an addition to the standard from stakeholders and TABS will have an opportunity to input into this. The time-frame for roll-out of the updated standard is that schemes move over to this by 1st April 2013. DfT will be issuing a press release around this shortly. CTUK hope to roll out the updated standard from the Spring term over all its courses. CTUK will be running a dedicated Mentor Training Day on the 12th December for those who wish explore the changes to the National Standard and help your schemes integrate these changes into your courses through In Service Training (INSET) and mentoring. The cost of attendance on this course is £120. To book a place on this course please contact Maresha@cycletraining.co.uk or call her on 020 7232 4382. Depending on the demand we may run another course early in the new year. CTUK is a not-for-profit workers' co-operative promoting cycling for all. Registered in England and Wales (number 4369994). I am glad the parents gave you this feedback as the work that has been done with those students is amazing. Seeing the students being assessed and teaching sessions delivered according to the students needs was really heartening. We can't wait for our teacher only day now! Thank you so much for the update and the great opportunity. Mc has come home each day bursting with pride at being able to pedal for a little and balance on the bike. It has really boosted his confidence! Kevin it has been brilliant - R. has learnt to ride in one day, when both G. and I have failed miserably to teach her - your instructors must be amazing - she has totally enjoyed the experience and I have nothing but positive things to say about it. Well done Huapai School . I just want to say a BIG THANK YOU to the school and to the Bike team. K-L has really enjoyed the classes very much and yesterday when she told me she could ride on her own, I wasn't so sure. But she said she would show me and when she got on her bike and cycled around the property all on her own, I couldn't believe it. WOW!! In such a short amount of time they encouraged her to ride! She didn't even own a bike a few weeks ago. I can't thank you enough for offering this programme. With no fuss or hassle she has just blossomed on her bike. Please pass on my Thanks to the team that taught her. This is a highly recommended programme. Just wanted to pass on a big thanks to you - the school and Harbour Sport.Due to one thing and another it has been rather hard to get A heading in the right direction with her bike learning. I look forward to biking with A after your great work and patience with her. HI Kevin just wanted to thank you for organizing this, its a great initiative for the school. On Monday M. attended the first group..... he came home so excited....dusted off his bike in the garage and got his dad to remove the training wheels pump up the tires and off he went to practice what he had learnt. Today Tuesday as I drove past the school at lunch time I could see him on his bright orange bike on the bike track riding solo, no training wheels, and a smile from ear to ear I stopped and he showed me "look Mum I can ride a bike". Fantastic I 1 day! He turns 7 on Nov 26th and high on list now is a new BMX bike. It was very exciting to see S. riding his bike this afternoon with a big smile on his face!!! He will be riding at Woodhill with his brothers in no time now thanks to these lessons. The next 3 sessions will be great for his confidence. You are completely right: whatewer one's age is he/she will definitely enjoy the feeling of cycling! Cool article!